It is popular to explain that the essence of Japanese culture is Zen. There are many great books to support such a notion. Their arguments are relatively easy to follow. However, in my view, there are many points about Japanese culture that contradict such a notion. 1 Zen buddhism is not necessarily the largest Buddhist sect in Japan. Probably the Pure Land sect is the largest and Nichiren related sects are also very popular. Then, how can Zen represent Japanese Buddhism or Japanese culture? 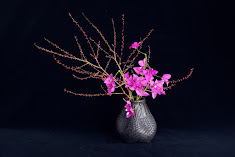 2 Ikebana is often discussed in terms of Zen Buddhism. Zen influenced many forms of traditional Japanese art such as the tea ceremony, Ikebana and Noh plays in the Muromachi period. However, the largest Ikebana school in Japan is Ikenobo and Ikenobo is affiliated with Tendai Buddhism, not Zen. Of course, Tendai does include Zen in their teaching. However, the position of Zen in their teaching is different from that in such typical Zen sects as Rinzai and Soto. 3 This is just my personal impression, but I did not find any Zen aesthetics in a Chinese Zen temple in Melbourne. What I mean by Zen aesthetics is purity, simplicity, or wabi that often represent Japanese aesthetics. Zen aesthetics may not be the same as Japanese aesthetics, which I always find in Shinto shrines. Japanese aesthetics may be more related to Shinto than Zen. These are all observation made by a novice. In the next issue, I’ll continue adding my questions about the statement that Japanese culture is Zen culture, and I’ll present my own hypothesis about Japanese culture. This is the work I made for Chotto, popular Japanese cafe on 30 Smith St, Fitzroy. I heard that they received very good feedback from their clients. Simple designs always work for commercial displays. I’ll talk about environmental art and Ikebana at the International Academic Forum in Kobe and at a Japanese university in April. On 29th I’ll conduct an Ikebana demonstration at Made in Japan, South Melbourne. On 3rd May, my course, “From Ikebana to contemporary art” at RMIT Short Courses will start again. 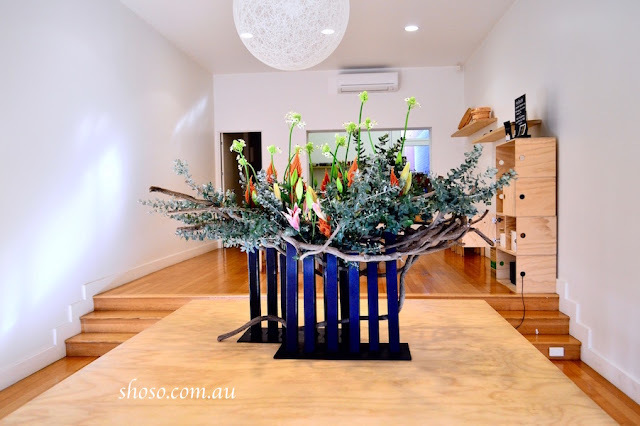 On 27th May, I will conduct an Ikebana workshop for beginners at Chotto, Fitzroy. Hope many of you can come and join us.